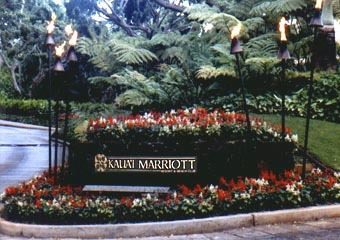 In September 2000 we did a timeshare exchange into the Marriott Kauai Beach Club resort. 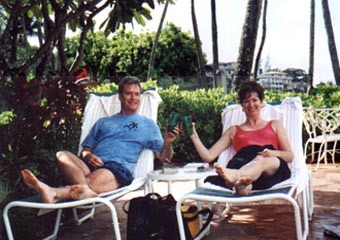 Kauai is our favorite island in Hawaii, and this was our third trip there. 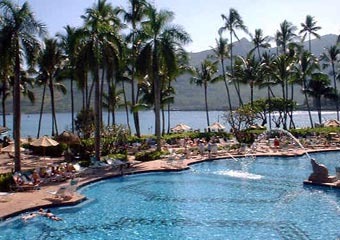 We spent a lot of time relaxing around the resort on this visit, because we had already done a lot of sightseeing on previous trips. 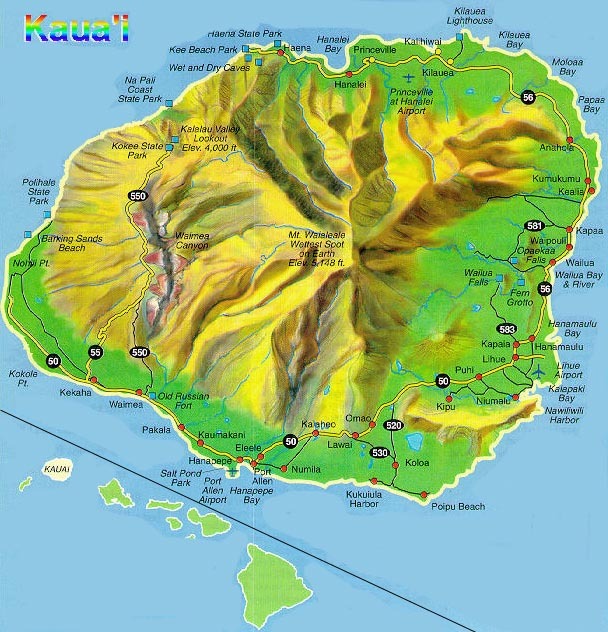 Most of these photos here are from this trip, but some from previous trips are included so that you can see more of the beauty of Kauai. 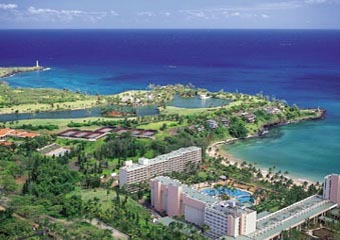 Here's an aerial view of the hotel/timeshare and the surrounding golf and tennis facilities. 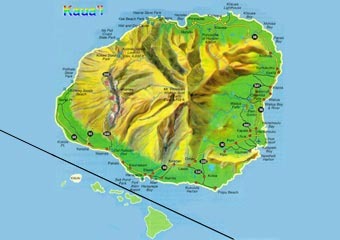 This is the island of Kauai (click for a larger image). 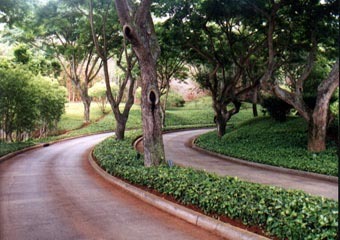 Here is the entrance to the resort... ... and the beautiful tree-lined drive to the lobby. 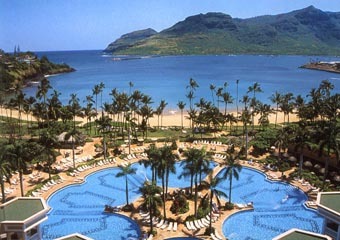 The resort has the largest pool in all of Hawaii, and it's wonderfully situated overlooking scenic Kalapaki Bay. 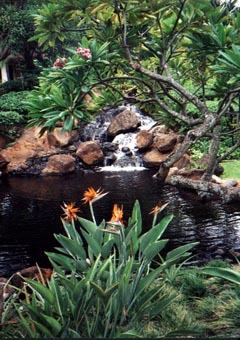 The resort grounds are beautifully landscaped with tropical plants and numerous waterfalls. 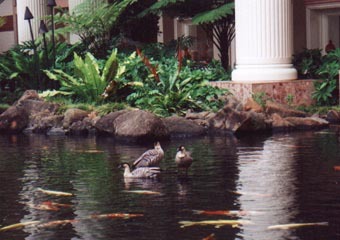 There are several Koi ponds, enjoyed by a variety of ducks, swans, and birds. 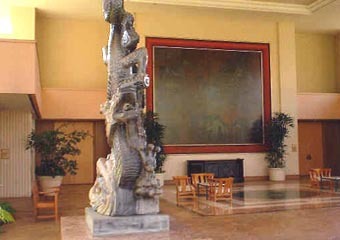 Here's one of several, large, outdoor courtyards off the gardens. A toast to the beginning of a great vacation! And this is the view from the the pool, across Nawiliwili Harbor.